Technology works great - when it works. Dani Guralnick was kind enough to lend me an iSight for my trip. It's been a while and the webcams have come a long way. Auto-exposure, auto-focus, plus a built in microphone. 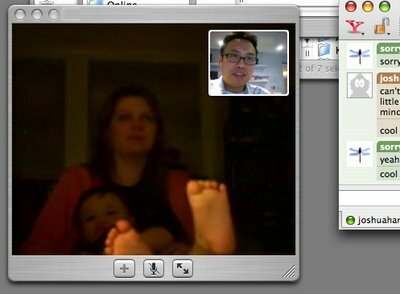 After a few days of working out the kinks I get to video chat my family. There's a half second lag, but I would expect that because it's on the other side of the planet. Big ups to my uncle working with the wireless router/firewall at my house to get this working. So when the internet connection is stable, web traffic is light and the Chinese internet police don't clamp down on me I can enjoy our conversations. As you can see above you can almost smell those little stinky feet.